Hey, where’s the time gone? I swear BlizzCon was not that long ago! Ah well, time has passed and I’ve been distracted by trying to do as many things non-WoW-related as possible. It’s probably the time of year, but once again I’m finding myself not in WoW and either playing other games or watching YouTube while chatting to people on Skype. 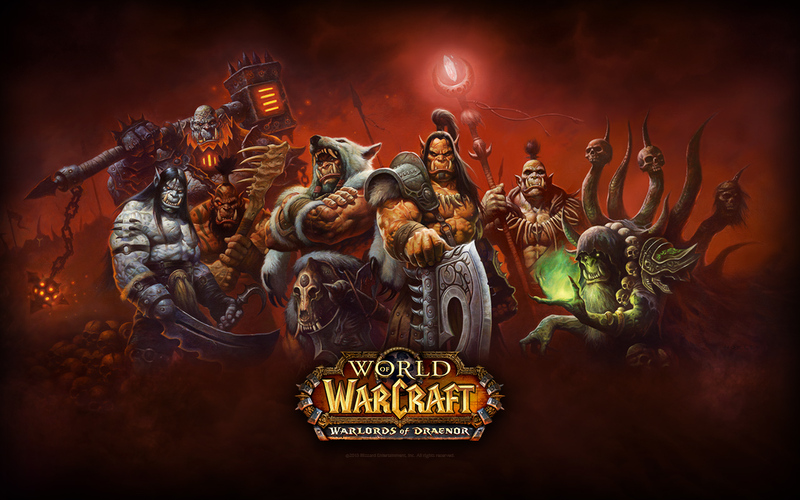 Regardless, we have had a LOT of information coming out of BlizzCon about the upcoming expansion, Warlords of Draenor! There was also content related to Blizzard’s other IPs, as well as the announcement of their new MOBA, Heroes of the Storm, but we’re talking about WoW today (as is usual) – more specifically about Moonkins, as I’m sure everyone’s already read everything there is to know about the upcoming expansion from various news sites and other blogs on the internet. Regardless, I’ve been getting a slight itch to play again, and overall I’d say my initial impressions of WoD now that all the hype of BlizzCon has truly died down, is an odd mixture between excitement and indifference. On the one hand, the first Blizzard game I ever played was Warcraft II – I’ve never played Orcs and Humans but I’ve read enough of the storyline to work out what’s gone on, so to go back to my Blizzard roots and experience heroes such as Ner’zhul (in orc form), Gul’dan, Blackhand and so on is quite an interesting story that I’d love to be immersed in. I can also appreciate that while we’re not getting new classes or races, something that has been an expansion-defining feature in the past, the amount of work that’s being put into the old character models will certainly feel like we have new races (QQ at the lack of Moonkin model updates though – Glyph of Stars it is if I want to have a pretty moment). I don’t really know what I feel indifferent about, and I’m certainly going to enjoy lazing around letting my garrison do my work for me. I guess it’s because that while I did watch the majority of the WoW panels with my virtual ticket, it felt like I didn’t really know what to expect other than the basic package. I’m sure I’ll know more about my feeling for the expansion once beta rolls out and we get more datamining of what to expect. Quite an underwhelming talent for us Moonkins – we essentially get to press an extra button every 20-30secs. Good for spread out adds and can become a predictable solid DPS boost. For ferals, we’re looking at something to help with our ranged capabilities… Something useful for fights like Atramedes where it’s impossible to get into melee range for certain fights, or a more recent example could be Dark Shaman where there might be points where going into melee is suicidal, and you can still offer DPS. No idea how it’ll match up with Heart of the Wild or if it becomes another debuff to keep track of, we’ll have to see where the numbers crunch. 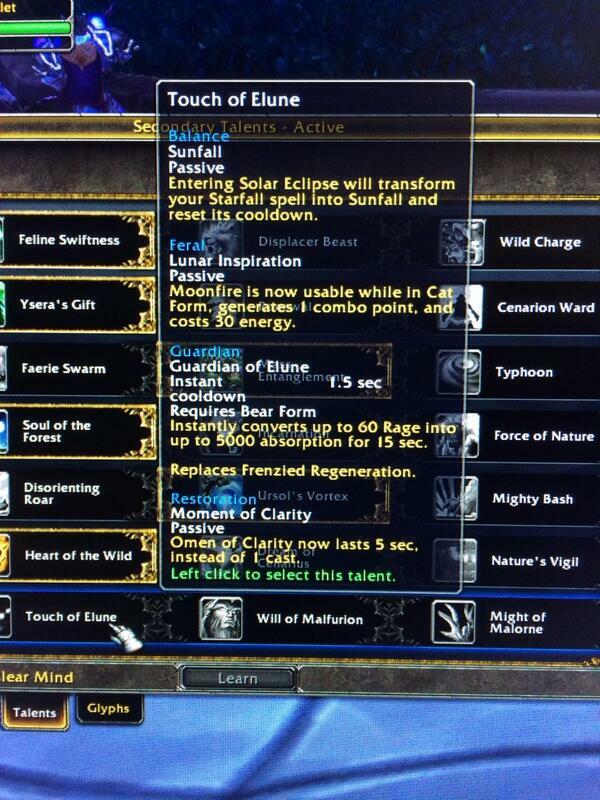 Guardian of Elune for bears looks to be absolutely major for them. I have to admit I don’t know Guardians at all since the active mitigation model came in, and with the item squish numbers aren’t going to be final, but in most cases, an absorb will be much more beneficial than a heal – especially when Savage Defense just won’t hold up in any case. No idea how this will affect the Frenzied Regeneration glyph – I imagine that if glyphed Guardian of Elune just changes into the extra healing received version, or it might just overwrite the glyph. Time will tell! For the healing branch of Druids, it would appear that we’re getting the legendary meta as a level 100 talent. If that doesn’t speak volumes for how an item augmentation positively affects a spec in a non-gamebreaking way, I don’t know what is. It’s a fantastic talent for Resto that I can’t wait to try out! Next up, we have Will of Malfurion, and Balance Druids have… Another button to push – one that makes us immobile too, nonetheless! It’s an AoE talent that we have been asking for, admittedly, in being able to “burst” AoE when the enemy’s on the move, and this talent allows us to do just that, on demand too instead of being a rotational ability like Star/Sunfall. The main downside of it is that we’ll still have to re-apply the Moonfire and Sunfire dots (although the wording doesn’t say it explicitly, I imagine this is the Balance version of Genesis and our dots will fall off 400% faster too), leading to more time outside of Nature’s Grace, our main DPS buff. Another downside is that we would be missing out on so many Shooting Stars procs during that time that our eclipse bar just won’t be moving for the dots’ duration. The talent has its uses for that burst multi-target damage, but once again it’s at the cost of our single target either before or after Zenith, so it may be more beneficial to let the real AoE-ers AoE and you can focus on killing priority targets. Ferals get a big stick here for their AoE sustained damage, adding another bleed into the mix of quickly whittling away packs of mobs. Other than that, it’s not entirely exciting, but it’s a massive AoE boost. Guardians get more tankier, placing a lot more emphasis on agility for those physical fights. Though with enchants and gems becoming less of a bonus to gear (until that warforged piece gives the bonus of a socket) and with the homogenisation of gear in Warlords, it might just end up being a passive damage reductions for a boss’s white swings and certain abilities. It’ll certainly be much easier to armor cap on a Guardian in WoD, and they may end up passing rings/necklaces/etc that have the bonus armor on them to their fellow tanks! Germination for Restoration seems to me like Blizzard liked the idea that we went for a huge leap in haste to gain an extra tick on our Rejuvenation when Genesis came into play, so this talent seems to be complimenting that to allow us to go back to having more mastery or spirit on our gear again, while just trying to get enough haste for Wild Growth additional ticks, or something. I don’t know how the dot snapshotting and Pandemic will work for healers, but this talent certainly caters for a particular playstyle of Restoration. Might of Malorne is the final talent waiting for us at level 100, and having no extra button to press for any of the specs makes me a happy Druid (when I want to be lazy)! Some parts of MoM mechanically change the way the spec is played. Balance gets to be in eclipse at all times, which I initially cheered at – it gives our mastery a use 100% of the time instead of ~75% of the time and should, depending on scaling, work well with intellect to make mastery a much more attractive stat (though not more so than how lovely crit is). As mentioned earlier, haste has somewhat devalued for us with the lack of dot snapshots and with us getting Pandemic to increase dot length, but it’s something for the number crunchers to decide when we actually get to test it! One major downside is we lose the benefit of Euphoria and it takes much longer to cycle through eclipses as a result, leading to less uptime of Nature’s Grace. Feral not only doesn’t have an extra button to press, but with this talent, they can actually take a button OFF their bars! This is a fantastic change again for Ferals that will likely be the go-to talent for any fight they don’t need to AoE on while having good uptime on the boss, and in PvP it looks like a major contender MoM and ToE, depending on how Moonfire balances out for Ferals. Plus, it frees up a potential glyph slot for those Ferals using the 0CP Savage Roar glyph. Enrage becoming a fairly major cooldown is a great rounding off for the bears in this tier – we have a change to our active mitigation to become an absorb instead of a heal; passive armor bonus from WoF for those physical-intensive fights; and this, a 50% damage reduction for the next incoming attack, be it magical or physical on a 1min cooldown, as well as the standard rage given to use on active mitigation straight after. Warlords has been kind to the bear for their talents, I can only hope that it helps with their overall viability in any case for raiding. Restoration gains an interesting mechanic for Swiftmend, that allows us to instantly nuke heal anyone who has an active Rejuv or Regrowth heal over time on them. This talent is interesting for many reasons – one being that the Regrowth and Efflorescence glyphs are now not as mandatory in my eyes, with the option to place multiple healing circles on the ground in quick succession, and it allows us to heal powerful damage that even Genesis won’t be able to cover. This also is quite a good tank/burst healing talent, in that we can have our standard Lifebloom and Rejuv rolling on a target, then be able to Regrowth > Genesis > Swiftmend > Swiftmend and still have the option of letting Lifebloom tick out, have Nature’s Swiftness still available for Healing Touch, or go for another Rejuv+Genesis combo. It’s interesting to see Blizzard bake the old Swiftmend glyph into the ability, then give us the option an expansion later to have its original effect on steroids. A Fire Mage might earn a +50% damage boost to Pyroblast, +30% boost to Scorch, or 35% boost to Fireball. Holy Priests could get their chakra cooldowns halved to 15secs. Shadow Priests could bank 2 shadow orbs to begin fights with. 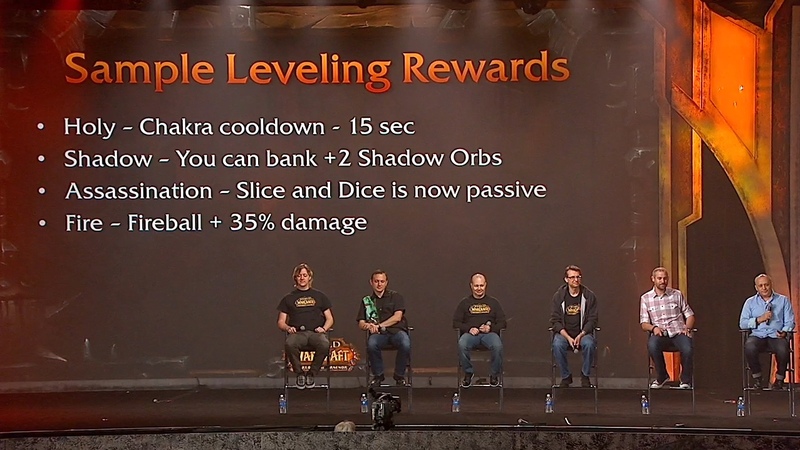 Assassination Rogues might be able to drop a skill on their bars, by making Slice and Dice passive. As you might be able to tell from these examples, Blizzard aren’t looking to increase our spellbooks any more than is required. With the rising popularity of League of Legends, it’s clear that people don’t particularly want a vast array of abilities to use in every situation, in order to counter X or Y mechanic. While Blizzard does cater to casual/solo play on occasion, they’ve got to understand that this is still a game that’s played with other people, and we’ve got to be able to compliment each other in our uniqueness. We’ve got to have our strengths alongside our weaknesses, so instead of creating new abilities that might just end up being fluff to counter what another class can do so that we can determine our spots in raiding or PvP. Starsurge/Shooting Stars to work off an Arcane Missiles-style stacking system. One of my pet peeves is that our greatest capability to be able to move in encounters is also our biggest damage increase. If Shooting Stars is allowed to stack twice, allowing two instant Starsurge casts, then my quality of life in raids would increase tenfold. With the loss to damage reduction, it’s harder for me to justify being able to stand in bad a tick longer than I should to get a spell off. The only other spec as immobile as us is Shadowpriests, but at least they don’t have to worry about eclipse cycles and Nature’s Grace uptime. Or have their most powerful cooldowns based on needing to stay still for 30secs. Yes, I’m grumpy. No, I won’t shut up about how immobile we are. Plus, having Shooting Stars proc again within GCDs is always painful to see, because of how your dots fall on targets. Starsurge damage may need to be reduced overall to compensate, but I’m fine with that if it means I can actually move out of poo. Mushroom damage to increase and deal spellstorm damage. Call me nostalgic, but I loved mushrooms as a style of AoE, and when Blizzard gutted their damage in Mists because they wanted us to use Hurricane/Astral Storm in their stead – at the moment they’re only really being used in periods of high movement and on pre-pull for procs. We can then have three (or more) different styles of AoE with increased damage, and don’t have to worry about Solar camping with the spellstorm damage: Burst, small range damage with the mushrooms; Sustained, small range damage with Hurricane; Sustained, spread damage with multi-dotting and Starsurge cleaving; or using Zenith if we’re specced into it. Other than those two changes, I’m actually pretty happy with Moonkins mechanically – we have our weaknesses in Nature’s Grace and its links to us needing to be moving our eclipse bar as often as we can. This is Blizzard’s opportunity to give people quality of life changes, such as not requiring to worry about Slice and Dice for Assassination in the example above. I can totally see them giving us bonuses for just +damage on rotational spells, so I wouldn’t hold my breath for anything mechanically changing until we start seeing the beta roll out. Even then, things may change until Warlords hits. While I can’t promise that this is me back to blogging regularly 3 times a week again, I probably won’t have another 6 week stint of no updates either. I’ll try to be semi-regular with my updates, but I don’t want to burn out again on blogging, as it’s something I do enjoy. See you next time guys!